Alison Gopnik's lab at UC Berkeley has revolutionized our understanding of infant and toddler intelligence. 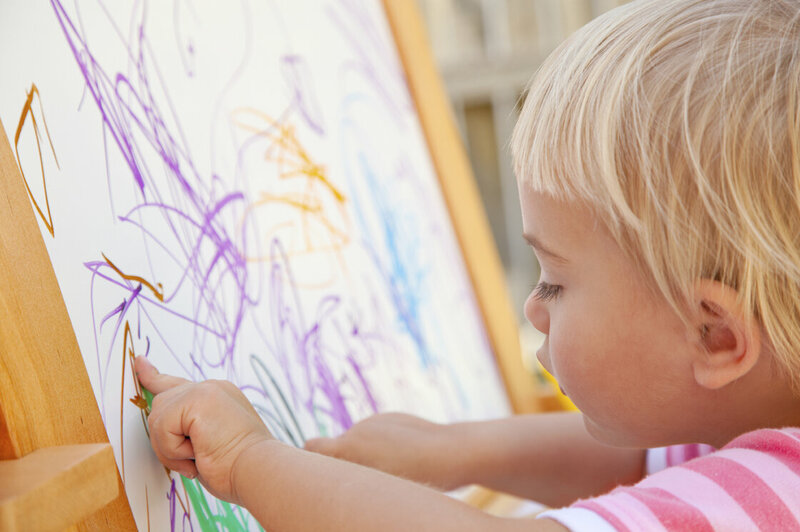 In some new research, Caren Walker, one of Gopnik's graduate students in cognitive development, led a study that showed that older children tend to focus on objects rather than the relationships between them. "Learning may actually harm these kids' abilities to do abstract reasoning," said Walker. Here is the abstract followed by the NPR story on the paper. Children make inductive inferences about the causal properties of individual objects from a very young age. When can they infer higher-order relational properties? In three experiments, we examined 18- to 30-month-olds’ relational inferences in a causal task. Results suggest that at this age, children are able to infer a higher-order relational causal principle from just a few observations and use this inference to guide their own subsequent actions and bring about a novel causal outcome. Moreover, the children passed a revised version of the relational match-to-sample task that has proven very difficult for nonhuman primates. The findings are considered in light of their implications for understanding the nature of relational and causal reasoning, and their evolutionary origins. Parents, does your 18-month-old seem wise beyond her years? Science says you're not fooling yourself. Very small children can reason abstractly, researchers say, and are able to infer the relationships between objects that elude older children who get caught up on the concreteness of things. In experiments at the University of California, Berkeley, children as young as 18 months were able to figure out the relationship between colored blocks. The child would watch a researcher put two blocks on top of a box. If the blocks were identical, the box would play music. The majority of children were able to figure out the pattern after they were shown it just three times. They would then help the researcher pick the correct block. The toddlers did much better at this task than do chimpanzees and other primates. The non-human primates have to practice doing the task themselves thousands of times to figure it out. And even then, it's only with lots of treats thrown in. That's not such a big surprise. What really got the researchers' attention is that the diaper set did better at this sort of abstract thinking than children who were just a few years older. TED Radio Hour: What Do Babies Think? "Older kids tend to be really bad at analogies," says Caren Walker, a graduate student at in cognitive development who led the study. It was published online in the journal Psychological Science. She says that older children tend to focus on the objects rather than the relationships between them. "Learning may actually harm these kids' abilities to do abstract reasoning." Walker is working in the lab of Alison Gopnik, a developmental psychologist who has made a career out of devising experiments that reveal the inner thoughts of children still too young to talk. Her take is that babies are smart, and in many ways smarter than adults. In this experiment, the box actually hides a wireless doorbell, and the researcher moving the blocks controls the music by tapping a hidden button with her foot. But the illusion of control is compelling, not just for the toddlers but for the parents who watch the experiment with their children, Walker says. The researchers tested their hypothesis by running the same experiment but letting the children see only one of the pair of blocks. They couldn't get the right answer more often than they would by chance. By contrast, 61 percent of the children got it right when they could see the blocks. And in a third variation, almost 80 percent were able to correctly deduce that they needed to choose sets of blocks that included pairs if they were going to do the experiment. "Even as incredibly young children, 18-month-olds are extremely powerful little learning machines," Walker told Shots. Walker and Gopnik are repeating the same experiment with older children, to see if they do indeed lose this very early ability to think abstractly, only to regain it later in the context of language and culture.